Sen. John McCain railed against the Defense Department's decision to put the University of Phoenix on probation, but his support for the school surprised veterans groups that previously criticized his record on veterans issues. Sen. John McCain unloaded on Reveal from The Center for Investigative Reporting and the Defense Department in a Senate Armed Services Committee hearing today, accusing the Pentagon of a “gross abuse of power” when it placed the for-profit University of Phoenix on probation last year. For two hours, McCain and his colleagues grilled officials in an otherwise empty chamber. The hearing focused on the Pentagon’s treatment of the for-profit college, which was the focus of an investigation into predatory recruitment practices by Reveal and PBS NewsHour. The Department of Defense subsequently launched its own investigation, confirmed our story’s findings and barred the University of Phoenix from military bases around the world for three months until outstanding issues could be resolved. But throughout today’s hearing, McCain, who is the committee’s chairman, cast the Pentagon’s action as the sort of bureaucratic overreach that he hopes will end after Donald Trump takes office in January. 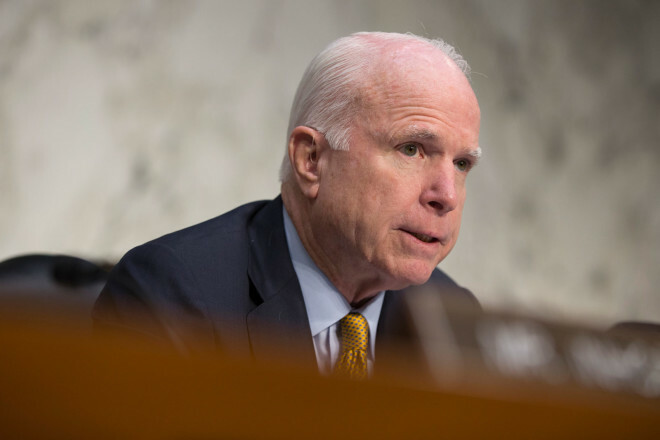 “This kind of abuse of power is something that I hope in a new administration will be totally unacceptable,” McCain said. McCain also said he hoped Trump – who earlier this month settled multiple lawsuits claiming fraud at the now-defunct for-profit Trump University for $25 million – would consider rolling back an executive order by President Barack Obama that the University of Phoenix was found to have violated. The order was designed to prevent members of the military from being unfairly targeted by for-profit colleges. In an extreme example that Obama said “should never happen in America,” recruiters from one college were caught enrolling Marines from a medical unit at Camp Lejeune, North Carolina, with head injuries so severe that they did not know what courses they were taking. Other Republican senators suggested this could be the first of many hearings targeting not the for-profit sector, but the enforcement actions against it. As an industry, for-profit colleges are known for low graduation rates and high rates of student loan defaults. According to the U.S. Department of Education, the University of Phoenix’s graduation rate currently is 17.5 percent. The Arizona senator grilled a panel of three Defense Department officials who testified, rebuking them for not reaching out to the University of Phoenix before punishing the school for breaking the law. Pentagon officials stood by their decision to place the school on probation but said they regretted not tipping off the for-profit college. “The process was crappy,” said Peter Levine, acting undersecretary of defense for personnel and readiness. Levine’s top deputy, Stephanie Barna, told senators that the department already was crafting new regulations that would require such notice be granted in the future. Aaron Glantz can be reached at aglantz@revealnews.org. Follow him on Twitter: @Aaron_Glantz.